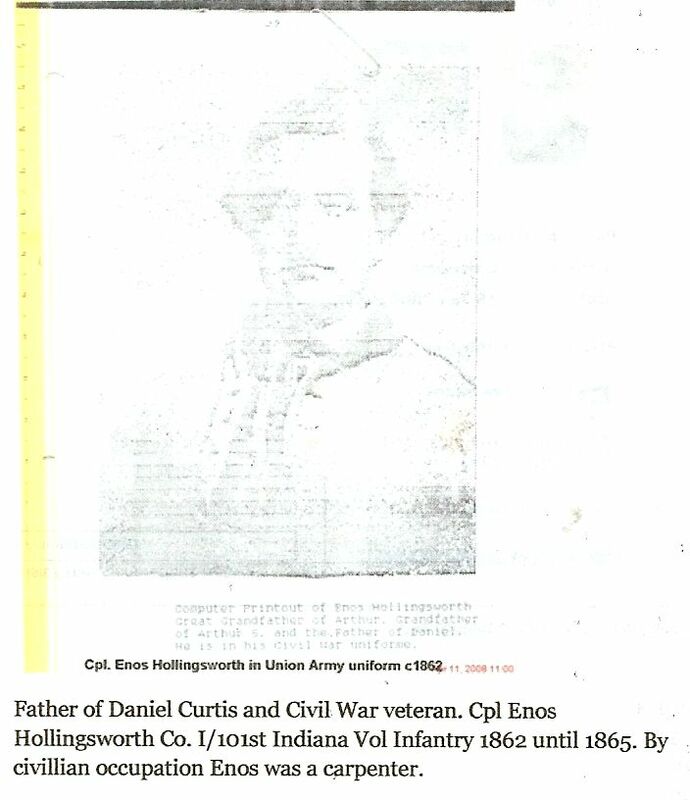 Cpl Enoch "Enos" HOLLINGSWORTH [Parents] was born on 25 Apr 1825 in West Branch Mm, Miami, Ohio. He died on 11 Dec 1873 in Oblong, Crawford, Illinois. Enoch married Eleanor HIATT on 27 Jun 1844 in , Grant, Indiana. Eleanor HIATT was born in 1825 in , , Indiana. She died in 1898 in Fairmount, Grant, Indiana. Eleanor married Cpl Enoch "Enos" HOLLINGSWORTH on 27 Jun 1844 in , Grant, Indiana. F i Belinda M. HOLLINGSWORTH was born in Nov 1845. She died on 13 Apr 1901. Christopher C. HOLLINGSWORTH was born in Dec 1849 in Mill Township, Grant, Indiana. M iii Daniel Curtis HOLLINGSWORTH was born on 10 Aug 1853. He died on 20 Oct 1934 from Skull fracture suffered in a fall down the stairs. Rosella HOLLINGSWORTH was born in Aug 1858 in Jonesboro, Grant, Indiana. She died in 1952 in Fairmount, Grant, Indiana. George W. BROCK [Parents] was born in 1817 in , , South Carolin. He died in 1846/1848 in Camden, Camden, Missouri. George married Minerva CLARK on 22 Dec 1840 in Marion, Grant, Indiana. Minerva CLARK was born in 1818 in , , Indiana. She died in 1878 in Camden, Camden, Missouri. Minerva married George W. BROCK on 22 Dec 1840 in Marion, Grant, Indiana. F i Mary Abigail BROCK was born on 8 Nov 1841. She died on 23 Oct 1923. Layton MILLS [Parents] was born on 18 Jan 1827. He died on 19 Nov 1869. Layton married Sally ALLEN on 22 Feb 1845. Sally ALLEN was born on 27 Mar 1826. Sally married Layton MILLS on 22 Feb 1845. Elizabeth MILLS was born on 19 Dec 1845. Elijah MILLS was born on 6 Sep 1850. Malona MILLS was born on 19 Oct 1853. Laura MILLS was born on 19 Oct 1855. Joseph Allen MILLS was born on 8 Jul 1858. Wiley Otho BURTON was born on 29 Nov 1875 in , , Texas. He died on 28 Jun 1956 in , Burnet, Texas. 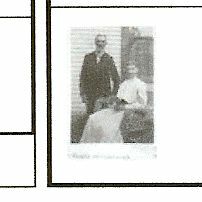 Wiley married Georgia Belzora "Belle" HOLLINGSWORTH on 6 Oct 1897. Georgia Belzora "Belle" HOLLINGSWORTH [Parents] was born on 15 Apr 1878 in , Burnet, Texas. She died on 6 Sep 1948 in Probably, , Burnet, Texas. Georgia married Wiley Otho BURTON on 6 Oct 1897. Otho - Ottis Douglas BURTON was born in Jul 1899 in , Burnet, Texas. M ii James Jewel BURTON was born on 30 May 1901. He died on 22 Oct 1998. 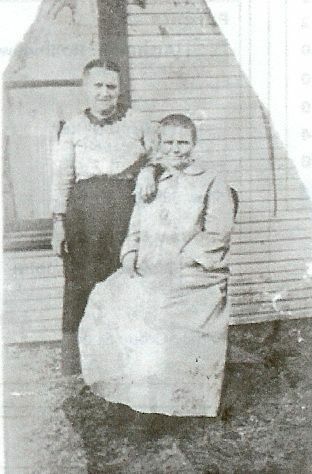 Annabelle BURTON was born about 1902. Joshua Ray BURTON was born about 1903 in , Burnet, Texas. M v Wiley Claude BURTON was born in 1904. M vi Warren Claude BURTON was born in 1905. F vii Bonnie BURTON was born about 1907. James Jewel BURTON [Parents] was born on 30 May 1901 in Near Spicewood, Burnet, Texas. He was christened in Spicewood, Church of Chist. He died on 22 Oct 1998 in Spicewood, Burnet, Texas. He was buried on 24 Oct 1998 in Fall Creek Cemetery, Spicewood, Burnet, Texas. James married Mary Alta DESPAIN on 5 Dec 1924 in Austin, Travis, Texas. Mary Alta DESPAIN was born about 1901 in , , Texas. She died in Dec 1986 in Austin, Travis, Texas. Mary married James Jewel BURTON on 5 Dec 1924 in Austin, Travis, Texas. F i Lovie Lamonda BURTON was born on 31 Jan 1929. F ii Jimmie Venita BURTON was born on 31 Oct 1940. Joseph Virgil "Chip" WHITLEY was born on 30 Sep 1926. He died on 6 Mar 2000. He was buried in Fall Creek Cemetery, Travis, Texas. Joseph married Lovie Lamonda BURTON. Lovie Lamonda BURTON [Parents] was born on 31 Jan 1929 in Spicewood, Burnet, Texas. She was buried in Fall Creek Cemetery, Travis, Texas. Lovie married Joseph Virgil "Chip" WHITLEY. M i Lonnie James WHITLEY. Darrell Gene BIBLE. Darrell married Jimmie Venita BURTON. Jimmie Venita BURTON [Parents] was born on 31 Oct 1940. Jimmie married Darrell Gene BIBLE. M i Darrell Eugene BIBLE was born on 7 Jan 1962. HATHERLY. HATHERLY married Bonnie BURTON. Bonnie BURTON [Parents] was born about 1907 in , Burnet, Texas. Bonnie married HATHERLY. Laine UNKNOWN. Laine married Cynthia WHITLEY. Cynthia WHITLEY [Parents]. Cynthia married Laine UNKNOWN.